Four years ago, the death of an indigenous teenager put Winnipeg on the map for all the wrong reasons. But instead of hiding in shame, the city - buoyed by its indigenous organisations - became a leader of Canada's reconciliation movement. The sun is setting in Winnipeg's North End and that means one thing - it's time for a walk. Every evening, members of the Bear Clan Patrol, a community safety organisation, patrol the streets, clean up drug refuse and keep an eye out for signs of trouble. But mostly, they just talk. "Hey Bear Clan," a young woman calls out from her perch on a sofa in her front lawn, while her children rush to the property fence to say hello to the volunteers. "Hey there!" waves back Travis Bighetty, a volunteer. As the group makes its way across an empty car park, a man on a bicycle stops them in their tracks. "Hey have you seen my cat? Keep a lookout - grey with green eyes," he says, before pedalling off in another direction. "Sure thing," another volunteer promises. To walk with the Bear Clan is to be known. Decked out in bright yellow vests, they have become a regular fixture in Winnipeg for the past four years, and their neighbours - whether they are homeowners or homeless - have grown to trust them. This year, the group has given out 32 tonnes of food to those in need, while helping connect vulnerable people to social services. "Really it's about building a sense of family in this area," Bighetty tells the BBC, once the patrol is over. That sense of family seemed impossibly broken in 2014, when the body of Tina Fontaine, a 15-year-old girl from Sagkeeng First Nation, was found in Winnipeg's Red River. Fontaine's death sparked a national outcry for missing and murdered indigenous women, and placed Winnipeg as ground zero for the crisis, with national magazine Maclean's dubbing it "Canada's most racist city". 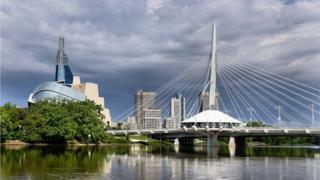 Home to the country's largest urban indigenous population, Winnipeg has about 95,000 indigenous residents or 12% of the city's overall population. Like in the rest of Canada, indigenous Winnipeggers are more likely to face poverty and homelessness, and more likely to interact with correctional or child and family services than their non-indigenous neighbours. The article was terrible timing for the city's Mayor Brian Bowman, who was elected just a year before. Although some suggested he should ignore the article or attack it publicly, Bowman said he felt he had to respond to the truths behind the criticism. "The stories in the article were heartbreaking and they were unsparing in their assessment of the community and its failings," he says. "We acknowledged that racism does exist, that we need to do better, and we pledged to do our part in order to become a leader in reconciliation." That word - reconciliation - carries an enormous amount of weight in Canada, where from 1840 to 1996, more than 150,000 First Nations, Metis and Inuit children were separated from their families and placed in the government-sponsored schools, in an attempt to rid them of their culture. Over 3,000 children died while at the schools over the last century, and many others experienced physical and sexual abuse, according to the final report prepared by the Truth and Reconciliation Commission in 2015. The report also drew linkages from the abuses suffered in these residential schools to the poverty, sickness and violence - like Fontaine's death - that disproportionately affects indigenous people today. "That was the turning point, that was the switch that flipped, that was the straw that turned the camel's back," Bear Clan member James Favel told the BBC. As a North End resident, Favel had been discussing starting a community policing initiative in order to tackle the growing problem of prostitution and trafficking. But rather than form a typical neighbourhood watch, Favel and other community members looked towards a uniquely indigenous model that had begun right there in the North End decades before. The Bear Clan Patrol was first founded in 1992 by a group of indigenous young men who wanted to keep their community safe from gangs. It petered out after a few years, but with the founders' permission, Favel revived it in 2014 with just a handful of volunteers. At first, Favel says local community members were too afraid to volunteer, so he had to rely on people from outside the North End. "They were reluctant to come out and patrol because they didn't want to have a negative interaction with one of these gang members... and then face them on their own the next day and be victim of some kind of violence," he says. "Through perseverance and persistence, we managed to prove that it's not the case and now we have community members coming out." Today, the organisation has grown into a large network with about 1,000 volunteers all over the city. Chapters have spun off in other Canadian cities like Thunder Bay, Ontario and Regina, Saskatchewan, and Favel says he has spoken to people from as far away as Japan and Australia who are interested in the group's success. "It went from people asking us what we're doing, 'do we think we'll actually make a change', to people coming up to us and engaging us and saying 'we appreciate what you're doing'," says Bighetty, whose brother was in the original Bear Clan in the 1990s. The Bear Clan is not the only indigenous-led group to form in the wake of Fontaine's death looking to make a change. Drag the Red was founded by Bernadette Smith after Fontaine's body was found in the Red River to help families of missing and murdered indigenous people. The group of over 100 volunteers search the river for human remains - although it sounds gory, they hope by identifying victims, they will help bring families closure. Michael Champagne, a community activist and organiser who founded social services organisation Aboriginal Youth Opportunities in 2010, says he thinks Winnipeg's indigenous response to Fontaine's death is an "important message for Canada". "Our dream is that we'll be able to encourage our relatives across Canada to take village-like action by measuring and celebrating the positive things that indigenous people do instead of just despair," he says. Meanwhile, the city of Winnipeg has made some progress in reconciliation. Bowman created an indigenous advisory circle, hosted an anti-racism summit, and mandated training for public employees. The city also created an indigenous accord, whose signatories promised to implement changes that would work towards reconciliation with the indigenous community. These efforts have helped turn the city's reputation around from being the most racist city in Canada to a leader on how to move forward. When Thunder Bay police came under investigation for systemic racism, spokesman Chris Adams said the police force was speaking to other cities, including Winnipeg, about how they have had success with improving community relations. But the bulk of praise should be reserved for the grassroots organisations that have been changing the culture on the street, say indigenous organisers. "We've demonstrated that it's possible," Favel says. "That there were people that cared about the violence and wanted to see it stop and were willing to step out of their comfort zone." Winnipeg still has a long way to go. Over the past two years, meth has flooded the streets, and it disproportionately affects vulnerable populations like the indigenous community. Many still live in poverty, and many children are still separated from their families in child services. "To me these are all fantastic attempts and initiatives that I think the city should be acknowledged and applauded for," Champagne says. "However... we can't look at the intention, we have to look at the impact."